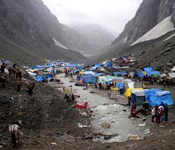 There are two routes that pilgrims can take to reach the Amarnath Cave located at a height of 3880 mtrs. One route is from Pahalgaon and the other is from Baltaal. The arrangements for food and rest on both the routes are made by the government of Jammu & Kashmir and private agencies. There are many non-profit non government agencies that provide many facilities free of charge to the pilgrims. The State Transport Corporation provides regular bus service to bring pilgrims to the base camps from where the pilgrimage commences. Private transport and tour operators also provide private vehicles and taxis to bring pilgrims from Jammu or Srinagar to Baaltal or Pahalgam. Security is also looked after by the state government. Ponies and dandies are arranged by the government but they have to be hired at a cost decided by the government. Booking for all facilities can be done online or from the J& K Tourism offices in Jammu, Srinagar, Delhi and other towns and cities of the country. Accommodation at Pahalgaon, Srinagar etc. is also under the purview of the State Tourism Department. Tented accommodation at all stations and stops on the routes to the Holy Shrine can also be booked in advance. All information regarding the Yatra is also available at all stations on the routes and from all offices of JKTDC. Registration of yatris is also done at the offices of JKTDC. Facilities for telecommunication for pilgrims are available at all stations and are managed by JKTDC. Community kitchens managed by various charitable organizations provide free food, tea etc. to the Yatris on the route of the pilgrimage. It is amazing to note that it is possible not to spend a single rupee on food or tea during the entire pilgrimage. These community kitchens called Bhandaras serve hot, freshly made variety of food. Good vegetarian food is available to satisfy all tastes for breakfast, lunch and dinner. Jammu & Kashmir being a border state is always on the alert for potential terrorist threats. 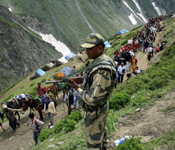 For the period of the yatra, a very large contingent of Central Reserve Police and State Police Force is put on duty to ensure safety and security to the pilgrims. Security Forces posts their men on the route as well as in the vicinity of the shrine. Medical facilities during the yatra are provided by the Indian Army, CRPF (Central reserve Police Force) and BSF (Border Security Force). Doctors, Para medical staff, equipment and medical supplies are available at medical posts on both the routes. Indian Army deploys the maximum number of medical facilities on all routes at Chandanwadi, Sheshnaag, Sangam, Panchtarni and near the Cave Shrine. These facilities are free for all pilgrims. Trained doctors are available round the clock to mitigate any medical emergency. 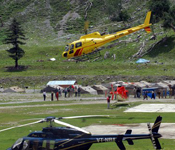 Amaranth Yatra Packages of many tour operators provide helicopter facility from Pahalgaon and Baaltal to Panchtarni and back at a price. From Panchtarni, it is only a 6 kms trek to the Holy Cave. The helicopter service is operated by private operators and regulated by Government Agencies.